It's really great to see Drew Struzan's art in one wonderful volume. All those that I've seen before were in different making-of and art-of books, particularly the Star Wars books. This book has much more than that. There are works dating back to the from the first Indiana Jones movie (1981), Star Wars (he drew for all of them), Back to the Future, Shawshank Redemption, Police Academy, Hellboy and a few movies which I didn't know existed. Going through this book made me feel like watching all those movies again. A very nostalgic collection. The paintings are gorgeous, nicely reproduced, and many printed full page. Also included are many variations of the movie posters, both in sketches and colours, and all almost as detailed as the final piece. There's some sort of magical quality in his paintings that evoke a sense of fantasy and adventure. Together with his traditional approach to art, he has created a style that's easily recognisable. Every page is a marvel to look at, to admire. Besides the art, Drew Struzan himself provided some commentary on the background stories and working with people. It's all very interesting to read. This is definitely one of the top art books for 2010. You probably do not want to miss this fantastic book. These are the movie posters I grew up with. Okay to be honest of course in the nineties many were as same as crappy as the ones of today but still, I love this style. It`s just more honest, intense... I don`t know but I love that. You often see all the heads of the protagonists and antagonists but in most cases it just looks silly, boring and dumb. But here? It`s good! It`s like magic, his style just makes it wonderful. And I still think it is a shame that the Hellboy art wasn`t used or at least wasn`t used as main poster and wasn`t used as public as it should have been. Picked this one up at NYCC with the print included and it is the book I'm most looking forward to reading! Coud You add some more photos of book ? I've added enough pictures. You can do a Google image search on his name. Hello Parka! Is there a chance you will review "The Movie Posters of Drew Struzan"? I think it's similar to this book and I wonder if there are many duplicates. 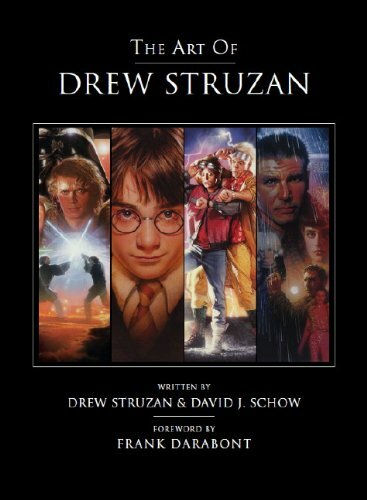 In the review of "The Movie Posters of Drew Struzan" you recommend buying the book reviewed here over the other, and I'm interested to know why. I saw on Amazon that this book has 160 pages and the other 120, but it's 160 including sketches and written material, and the former is 120 pages of posters only. So which one has more posters? In terms of official movie posters, this book might have less - I didn't count the actual number anyway. But this book has a lot more art because for each poster featured, a lot of unused variations, about 2-8, are included. And the commentary is really good. You wouldn't believe how hard this book is to find in England. I mean it's almost as though the publishers don't want people to buy it. I've tried in all the bookshops and nothing. I had it on order for over 6 weeks, when Amazon cancelled it! Useless. I finally tracked down a second hand copy and wouldn't trade it for the world. More people need to be able to see this fantastic book as it's incredible content will inspire all.